Most homemade Philly influenced cheese steak sandwiches, are made using frozen processed meat. The meat which I have used most of my life can be purchased in the frozen foods area of the supermarket. It comes in a box containing sheets of flattened and pressed chipped steak pieces formed into thin rectangular shapes. Each sheet is packaged with wax paper between them so they can be taken apart easily. The local Farmer’s market has spoiled me as they have chipped prime rib for sale and it takes the typical cheese steak sandwich up to what I refer to as gourmet in flavor and tenderness. The finished classic sandwich also has sautéed (or fried) onions and cheese. Some of the joints that sell them, use a processed orange-colored cheese that is kept in a continuous melted consistency. Some others use either American, provolone or mozzarella cheeses. Occasionally, we travel into South Philly (Philadelphia), to South 9th Street to the Italian Market. There is about two city blocks of open air vegetable markets lining the side walks on both sides of the street. The selection of fresh fruits and vegetables are mind-boggling. We always go to the same shops to buy delicious cheeses (Di Bruno Bros.), incredible fresh pasta cut to order (Talluto’s Authentic Italian Food), tasty ostrich steak from butchers, and a pastry shop that has the most delectable Italian pastries, cookies and cakes (Isgro’s Pasticceria), which is located on Christian Street about a block and a half west of 9th. My favorite cookies are the Italian pignoli and I also love a convection called a lobster tail. At the Italian Market, I have also bought fresh shark steaks, halibut filets and colossal shrimp. When we go, I pack a large cooler with ice plus I take reusable bags to carry purchases. We often stop back to the car and unload our goodies so we don’t have to carry them. The experience is a must do for any foodies visiting Philadelphia. 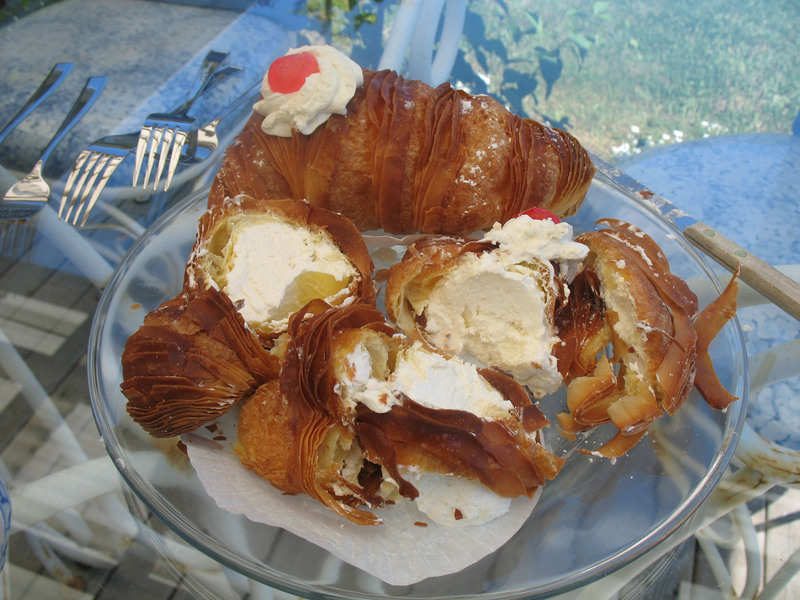 Lobster tail pastries from Isgro’s Pasticceria. Copyright 2014, Deborah Kaplan. Slice onion and microwave for 2 minutes on a paper plate. Add the onion to a skillet with butter and continue to saute until tender, about 10 minute on low, stirring occasionally. While the onion is cooking, unwrap the prime rib. Add the chipped prime rib to the skillet on medium heat with the onions and cook the meat until brown in color, about 10-15 minutes flipping the meat over to get all sides. Once the meat is browned, add the cheese and cook for an additional 3-4 minutes until melted and mix it thoroughly with the rib-eye and onion mixture. Slice rolls on one side length wise, and part of both ends to form a butterfly shape. Place rolls with conjoined side down and spread them open. Divide meat mixture into 4 equal parts and fill each roll with the meat mixture, then close rolls. Serve with French fries, onion rings or chips.